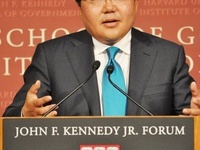 His excellency Tsakhiagiin Elbegdorg, President of Mongolia and HKS '02, makes a public address about Mongolia's peaceful transition into capitalism and Democracy at the John F. Kennedy Jr. Forum on Friday, September 21. President Tsakhiagiin Elbegdorj of Mongolia discussed corruption, human rights, and his success in revitalizing his home country at the Institute of Politics on Friday. Championing the cause of the peaceful democratic revolution he launched to overthrow the long-standing communist regime in Mongolia, Elbegdorj offered a forceful diatribe against the widespread corruption in government that he successfully fought against, twice as prime minister and now as president. Harvard fuel” even now as a head of state. 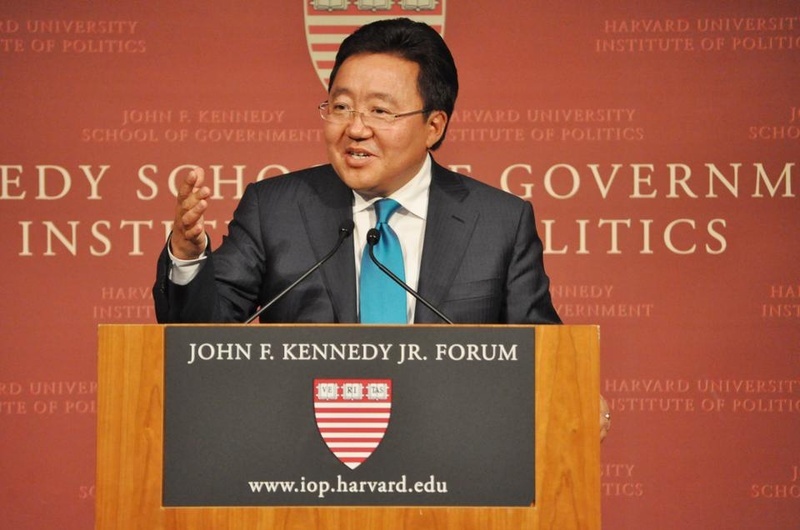 Elbegdorj also referenced Harvard landmarks like the COOP in his speech. “Ten years ago, I bought t-shirts for me,” he said. “Now...I bought some t-shirts for myself and my children—25 t-shirts,” he added to laughter, referencing his five biological and 20 adopted children. Elbegdorj also took the time to poke fun at the popular photograph of multiple heads of state, in which President Barack Obama accidentally blocked Elbegdorj’s face when waving his hand at the camera. The photo went viral in the fall of 2011. “President Obama’s hand can cover my face, but his hand is not going to cover my country,” he said. Among the audience members were former governor of Massachusetts, William F. Weld ’66, former prime minister of Greece, Georgios A. Papandreou, and former President of Ecuador, J. Jamil Mahuad. Mahuad noted the importance of having three heads of states at one event, but also mentioned the pleasure he received from seeing Elbegdorj, a former classmate of his in HKS. ‘“We need to make sure that people have the power and that there is transparency and accountability in government,” he added. —Staff writer Sagar Desai can be reached at sagardesai@college.harvard.edu. —Staff writer David W. Kaufman can be reached at davidkaufman@college.harvard.edu.